The total solar eclipse of March 8 to 9, 2016, reaches totality in this still image from a NASA webcast from Woleai Island in Micronesia. Aug. 21, 2017, is a red-letter day for eclipse enthusiasts. On that date, the sun will be partially eclipsed over an immense area that includes all of North America, the northern third of South America, much of the eastern Pacific Ocean (including the Hawaiian Islands), virtually all of the north Atlantic Ocean and a slice of western Europe. For much of the United States, at least 80 percent of the sun's diameter will be eclipsed by the passing new moon. Some eclipse chasers have billed it as the "Great American Total Solar Eclipse." Although many people have viewed a total eclipse of the moon, few have been lucky enough to see a total solar eclipse. In the 21st century, total eclipses of the sun occur on an average of once every 17.6 months, but they're often only visible over open water or from sparsely populated areas. Indeed, Americans under the age of 40 who have never ventured outside of the country have never witnessed a total solar eclipse. Since 1960, just three such events have been visible from the U.S. mainland — on July 20, 1963, March 7, 1970 and Feb. 26, 1979. But at long last, next summer, this greatest of celestial roadshows will be coming to a sky near you. Map showing the path of totality for the "Great American total solar eclipse" of Aug. 21, 2017. This August 2017 eclipse will have a potential viewing audience of at least 12 million people who already happen to live within the totality path. However, about 220 million people live within a one-day drive (about 500 miles, or 800 kilometers) of the totality zone. At local sunrise on Aug. 21, 2017, the dark umbral shadow of the moon will first touch Earth at a point in the North Pacific, about 1,500 miles (2,400 km) northwest of Hawaii. And then, for the next 193 minutes, the shadow will first head east-northeast, then east and finally southeast, darkening a narrow strip of North America along the way. For the first 28 minutes, the shadow will only touch open ocean. The shadow will make its first landfall along the coast of Oregon at Yaquina Head, a headland extending into the Pacific Ocean north of Newport. As it traverses the United States, the total eclipse will be visible within a path of darkness stretching from Oregon through Idaho, Wyoming, Nebraska, Kansas, Missouri, Illinois, Kentucky, Tennessee, Georgia, North Carolina and finally South Carolina. The path will average 67 miles (108 km) in width, but it will widen to a maximum of 71 miles (114 km) while moving through western Kentucky, about 12 miles (19 km) northwest of the town of Hopkinsville (population 3,000). At the Oregon coastline, totality lasts less than 2 minutes, as the shadow will be traveling at more than three times the speed of sound (2,400 mph, or 3,860 km/h). Heading southeast along the center line, the totality time slowly lengthens, reaching a maximum of 2 minutes and 40.2 seconds at a spot in southern Illinois about 12 miles (19 km) southeast of the city of Carbondale. The shadow will slow to 1,450 mph (2,330 km/h) as it moves through the Tennessee Valley, and then speed up; subsequently, the duration of totality will begin to diminish. Indeed, when the eclipse arrives at the South Carolina coastline, the duration of totality will have dropped to 2 minutes and 34 seconds. The shadow then exits out to sea, finally leaving Earth 75 minutes later at local sunset in the North Atlantic Ocean, 390 miles (628 km) southwest of the island nation of Cape Verde. Notable cities that fortuitously find themselves inside the totality path include Idaho Falls; Casper, Wyoming; Lincoln, Nebraska; Columbia, Missouri; Nashville, Tennessee; and Columbia and Charleston, South Carolina. The metropolitan areas of Kansas City and St. Louis straddle the southern and northern edges of the totality path, respectively. A number of cities and towns lie just outside of the totality zone, and their residents will see the sun cut down to an exceedingly thin sliver of light. These include Portland, Oregon; Boise, Idaho; and Knoxville, Tennessee. But a partial solar eclipse pales in comparison to a total one, even when more than 99 percent of the sun's disc is obscured. The great show can only begin at the moment when the last speck of sunlight is extinguished. Earlier, I said that 12 states lie within the eclipse path, but to be more precise, there are actually 14; the shadow will also give glancing blows to two other states. About 5.4 square miles (14 square km) of the southernmost tip of Montana's largest county, Beaverhead, will be tucked just inside the northern limit of totality, providing up to 50 seconds of total eclipse. And an even tinier plot of land — 0.7 square miles (1.8 square km) — in the extreme southwest corner of Iowa's Freemont County will be barely nicked by the shadow's northern edge; there, totality will last up to about 30 seconds. And if you live in either Kansas City or St. Louis, you'll want to know where the boundary line will run between a 99.9 percent partial eclipse and the far grander spectacle of a total eclipse. In Kansas City, the southern edge of totality lies very near to the Central Avenue Viaduct Bridge in the Central Industrial District; the farther north you go, the longer the duration of totality. Totality will last longest in the neighborhood of Ferrelview, with a duration of about 2 minutes. The table below provides local circumstances for 21 cities that are within the path of totality. For each location, it gives the local daylight time (LDT) of the beginning of the partial phase (First Contact), the start of totality and its duration (Dur.) and the altitude (Alt.) of the sun above the horizon at midtotality. Finally, there's the end of the partial stage (Last Contact). "P.A." is the position angle of the point where the sun's and moon's discs touch. It is measured clockwise around the sun's edge from 0 degrees at the north point of the disc. Hence, the value 42 degrees for Yaquina Head means that the first "bite" out of the sun will appear in the upper right part of the solar disc. To help observers pick the best opportunity for cloudless skies on Aug. 21, 2017, many experts are scrutinizing climatological records in and near the path of totality. Climatological cloud amounts are consulted only because there are no reliable alternatives. Unfortunately, meteorological weather forecasts for eclipse day are not possible more than a week or so ahead of time. The best probabilities of clear skies for eclipse viewing appear to be in the region running from western Oregon through Wyoming, where, on average, the odds for fair skies are on the order of about 70 to 80 percent. Going farther east, the odds gradually diminish; across the Piedmont plateau to the Atlantic coast, it appears to be just about a coin toss: 50-50, except perhaps less than 50 percent for people in the western mountains of North Carolina and the coastal plain of South Carolina. People living around the immediate Pacific coast of Oregon, with its gusty onshore winds and frequent bouts of low cloud and fog, appear to have the lowest odds of seeing the eclipsed sun — probably only around 40 percent. Regardless of where you plan to be, staying mobile to dodge cloud cover will always enhance your chances. 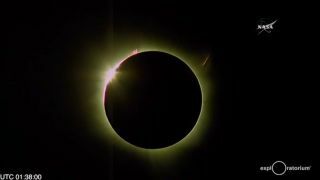 Space.com will be providing more details about the "Great American Eclipse" in the coming months. But for now, be sure that when you get a 2017 calendar, you put a big red circle around Aug. 21! Editor's Note: This coming Aug. 30 at 7 p.m. EDT, Space.com Night Sky columnist Joe Rao will be giving a special presentation at New York's Hayden Planetarium titled, "Countdown to Totality." Joe will detail all the specifics concerning next year's big solar sky show and, utilizing Hayden's state-of-the-art Zeiss IX planetarium projector, will attempt to replicate the sights and sounds that accompany an actual total eclipse of the sun. Joe Rao serves as an instructor and guest lecturer at New York's Hayden Planetarium. He writes about astronomy for Natural History magazine, the Farmer's Almanac and other publications, and he is also an on-camera meteorologist for News 12 Westchester, N.Y. Follow us@Spacedotcom, Facebook or Google+. Originally published on Space.com.